P.S. We found martini II lookin very potent round in la collette too!! Thanks! although I've only got 11 cylinders running at the mo, new coil driver at the post office awaiting collection. I can't make tomorrow either as I'm working, but I will be out early Saturday morning taking some local birdwatchers to Les Minquiers so they can ring the shags. I may see you at sea or in the marina. Thank you Erin and GJwhateveritis shame we cant meet this time, but i hope in the summer to be over regularly so i hope we could do something then. GJ im afraid Im returning to st malo today, i doubt whether ill be around tomorrow but if i do go out ill probably go out to the minquiers or chausey. What time do you finish work martini? Sunset is at 1950 (english) and st malo shuts at 19(eng) so i'd like to leave at about 1730 latest. If you were around then maybe we xould run out to the minquiers before you head back? Over these past couple of days the fuel consumption on the e-tec has been fantastic, coming up from St Malo on Wednesday (fairly rough) 33miles, a blast yesterday up to Echrous and down via Gorey, and a good high speed blast today all added up to only 130 litres having been used. Its a bit of a pain not having an accurate fuel gauge meaning we always have to top off to know how much we've used, there is a marked change in performance with full compared to half tanks. ... taking some local birdwatchers to Les Minquiers so they can ring the shags. Do you have to get any permissions from the States or Harbour Office for that kind of trip? 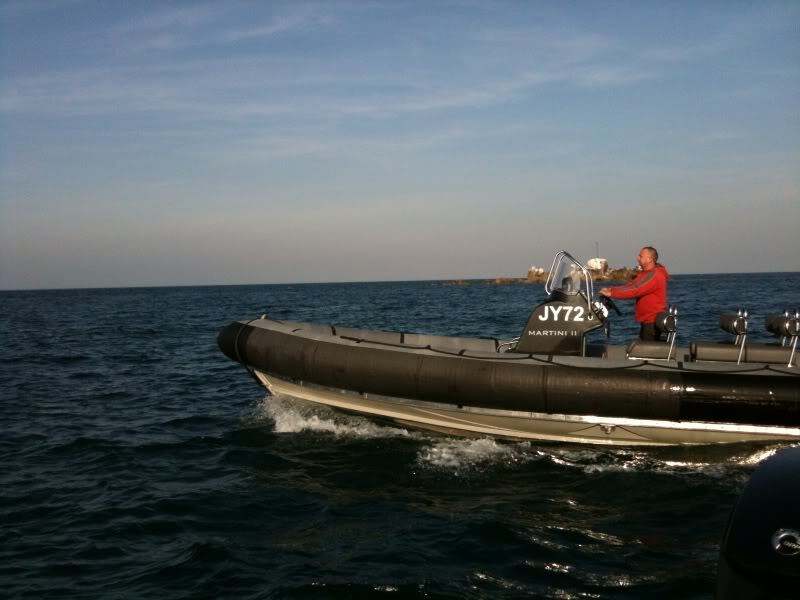 Our local birders have had terrible trouble with boating activities and have ended up coding their boat in order to satisfy the regs, so it would be nice to know if Jersey is more relaxed? No, I take them down myself as I've known them for years. I just let Jersey Coastguard know because when people see birds being trapped they may think we're trying to harm them. The ringers mentioned that permission is required from the Alderney authorities to land on Garden Rocks (have landed their myself years ago to help ring gannets) and Ortac. I think the thing here is not just the permission to land but also that bird ringing is not considered a recreational activity and so comes under coding.